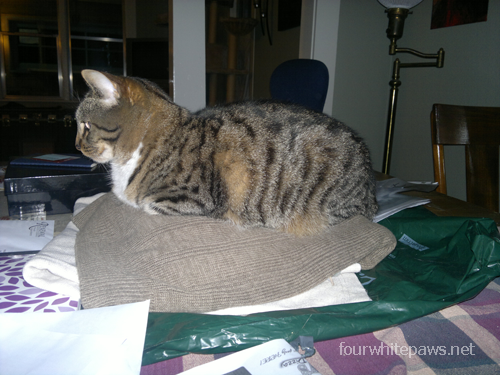 Rose claimed the stack of my sweaters on the dining room table as her throne. She didn't even move when I sat down at the table to have breakfast! She never lets humans get that close! Every so often we see signs of her coming around. A few years ago, Rose spent about 6-months working on her hiss. She would go into the kitchen or another room that was empty and she would hiss - over and over again, hiss... hiss... hiss... She tried out different sounds and volumes until she got the one she wanted. 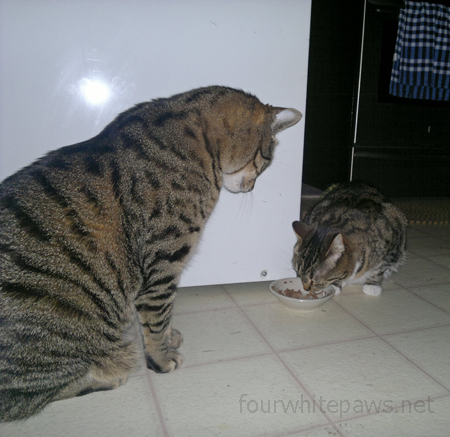 She would also try out the various hisses on the other cats after dinner. She would finish her dinner and hang out in the middle of the living room and wait. Any cat that walked near was subjected to her terrifying hiss. All that practice has really paid off, as now her mighty hiss has the power to keep Theo from stealing her food. Rose is the only cat in our colony who successfully keeps Theo from stealing her food and she does it with her mighty, well practiced hiss. Practice makes perfect!! Go Rose!! I had a cat that had a hiss that would scare everyone!! Go Rose! I love the name Rose! Mighty girl, you keep those food thieves away from your bowl! Angel has been practicing her hiss too, at Patty O'Malley who tends to stake out a claim on the front porch, and Angel and Chuck can see him through the front door; they are only a couple feet apart. Hey, Rose, good for you! keeping Theo at bay sounds like no easy accomplishment. I wish I had more time to blog and comment. I will be trying to carve out more time for this in my schedule coming up. I so love my connections with you and others here! Good job, Rose! That's my girl! Keep the thieves away, like a brave cat that you are! Rose, you are THE one in that household! A year of practice makes purrfect! Good going, girl! GIRL POWER!! You gooooooooooo Rose!! I would not mess with a hisser sister!